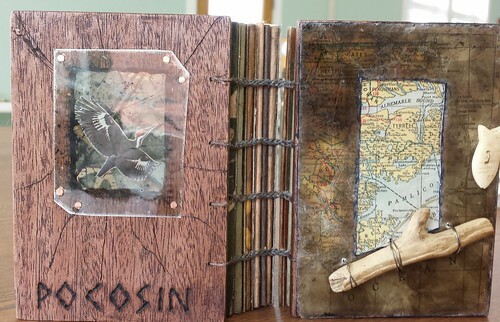 Dan Essig is one of my favorite artists and I’ve taken three other classes from him. If I lived a little closer to him I’d probably bug the crap out of him all the time. It’s good to catch him in North Carolina, and his classes fill quickly. He and I connect on the “cabinet of curiosities” type work. 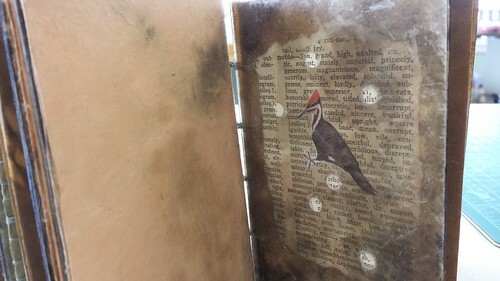 I love searching for quirky or even ordinary objects and squirreling them away for my own little museum. Maybe I should have been a Victorian. My house is full of pebbles and shells and feathers and sticks. 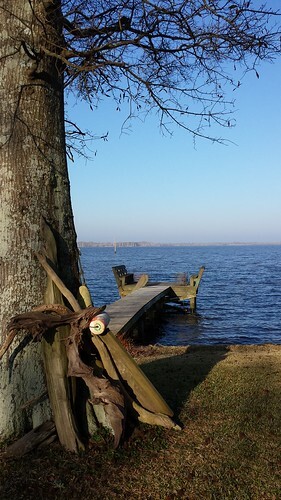 We stayed with some artist friends of Susanne’s whose house was on the Albemarle Sound. It was filled with art and antiques and musical instruments and books. Piles of patchwork blankets for the beds, of which Carol said that she made one per year. We didn’t get to spend much time there, but this was a special place and Carol and I would be good hangout all the time buddies if we had a chance, I could tell. 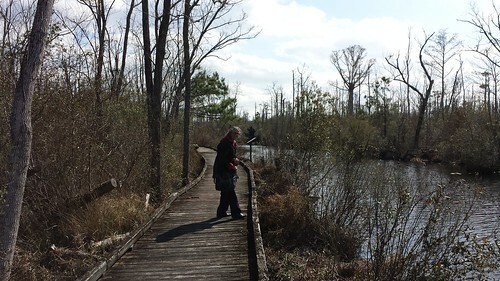 Susanne and I took a lunchtime walk on the riverwalk at the Pocosin Lakes National Wildlife Refuge center in Columbia on the Scuppernong River on the first day, where we saw a pileated woodpecker. That gave me a focus for my book in the workshop. My work almost always has a theme around place, and so I gathered stuff from the boardwalks and the bushes and the grounds and the refuge center to compose a book about the refuge, with Woody as the main character. In the evenings, we gathered for a happy hour in the center’s gallery and then joined the other attendees at the Old Salt Oyster Bar down the street. We didn’t buy the meal plan for the retreat in an effort to save money, but their buffet looked delicious. We ordered off the menu and ate at the bar. I have to say that their gumbo was incredibly rich, some of the best I’ve ever eaten. The fried oysters were cooked perfectly, crispy, plump, and juicy. If you are planning to vacation near the Outer Banks and go down Hwy 64 to Manteo through Columbia, you should definitely give this restaurant a visit. 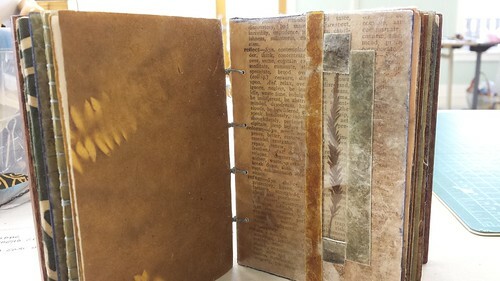 Here are some shots of the workshop and the books we made. We worked on them right up to the last minute and took home supplies to keep going. 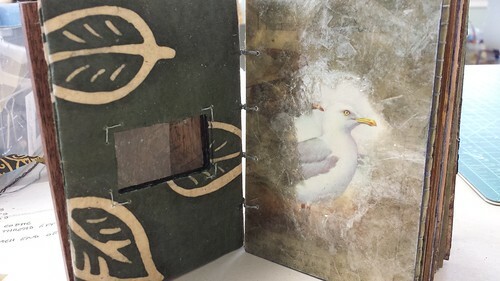 Dan’s workshops always leave me inspired and more skilled – if you are seriously into book art, I highly recommend that you study under him. 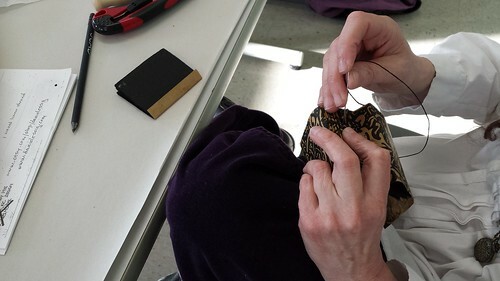 Each of us made a small book bound on an accordion fold to teach coptic stitch and to experiment in. 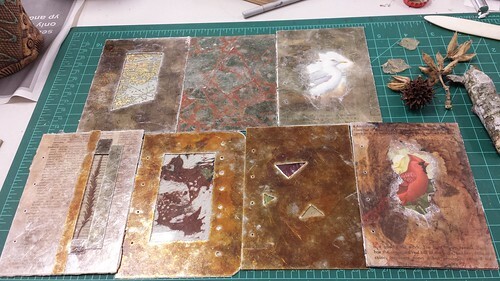 Some of my mica pages, pre binding. It is difficult to photograph mica! I still haven’t gotten a successful photo of my favorite page with the bee, cicada, and snail shell encased in windows. Covers: We played with power drills and woodburning and nails and hammers and chisels and glue and paint and shoe wax and wire and ink. Fun stuff. I want to call this guy Senor Seagull for some reason. Maybe Don Seagull? Old thesaurus pages were in the background of several pages. I tried to pick the words carefully. Anyway, I would like to go back to this retreat next year if possible. It’s at a bad time of year for me, though. I managed to get things done to take a couple of days off, work overtime ahead of time, all that, then I came back sick as a dawg and was home from work for another three days. Thankfully I’m recovering now and will get back into my studio this weekend, because I’m full of sweet inspiration. Oh, and by the way, this blog will celebrate its eleventh birthday tomorrow. How about that!! !